The unfolding scandal at Quinn Insurance is not a subject that is at the core of this blog, the real interest in Sean Quinn up to now has been the €500m property empire. However the revelation in the High Court this week that Quinn Insurance might cost the nation an upper limit estimate of €1.65bn firmly grabbed the attention. So there are two follow-up blogposts to yesterday’s “Idiots Guide” to the scandal, this one deals with what may be the most challenging and informed exchange on the subject of Quinn Insurance that we ever get, from the point of view of Sean Quinn. 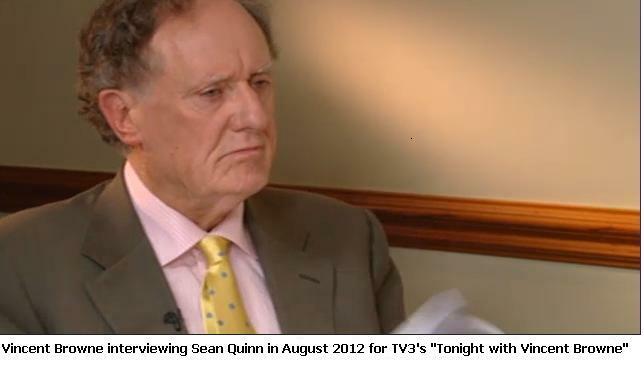 On 1st August 2012, Vincent Browne interviewed Sean Quinn for the TV3 “Tonight with Vincent Browne” show. Bear in mind that Vincent notified us that the broadcast interview was edited. This section of the interview – from 11:00 onwards in the programme – deals with Quinn Direct and it does seem to an amateur’s eyes and ears at least to be intact, but please bear in mind that it might have some editing. The interview was obviously quite tense and subjects break off mid-sentence, it would ruin the flow of the interview to put omissions in  and to litter it with (sic). Whilst it is clear that Vincent did his homework before the interview, he seems to have overlooked the fact that at least half the losses at Quinn are apparently attributable to the decline in value of investments, and that there were losses of €706m at Quinn Insurance for 2009 – Sean Quinn’s last full year in charge – and the focus is on Sean Quinn removing funds from the company in 2007/8, the underselling of insurance in the UK, there being no full-time actuaries and Sean Quinn not being an appropriate person to have remained at the helm of an insurance company. Vincent Browne: Let’s go on to another issue. And that is your complaints about the fact that Quinn Direct was taken over, and you lost control of Quinn Direct at the behest of the Financial Regulator, Matthew Elderfield, that it was false, mistaken and vindictive. Wouldn’t it have been reckless and grossly irresponsible of the Regulator to allow someone to have maintained control of an insurance company that had behaved as you had done, in relation to Quinn Direct by taking out €280m out of the company, out of the cash reserves that was there to pay any claims that your customers might have on their insurance policies. You took that money out in order to make margin calls on contracts for difference. Utterly illegal act, and wouldn’t it have been extraordinary for the Regulator to have allowed somebody who had done that in charge? Sean Quinn: Maybe I should clarify a few points on that. The money I took out in 2007 and 2008 should not have been taken out, hands up I was wrong, I agree fully. We met with the Regulator, we discussed it, we told him what the position was. It was not an illegal act. It was that I should have got permission to take the money out. I didn’t ask for the loan and I didn’t ask for the loan What they did was sanction me, and sacked me as chairman from Quinn Direct and I have no complaints about that, good bad or indifferent. But the position then is this Vincent. Between then, and the end of 2009, Quinn Direct done particularly well. It increased its cash position by a further €195m, the first quarter of 2010, which was the first quarter that Mr Elderfield was in Ireland, it had a record quarter, it reduced its claims by 2,800 which was a record reduction in claims. It increased its cash by €20m so the problem of 2007 and 2008 was well gone past. Everything was, a new board was in place, and the company was doing particularly well. SQ: We had actuaries. Let me put it this way. If you want to talk to me about actuaries. And I tell you, I didn’t intend saying this but you are pushing me very hard. If you want me to tell you the position now. I have documentation there that shows that the highest inception rate they had for the first two years that they went in there, the highest inception rate they had in their book was the highest loss rate. So the worst loss ratio was the highest inception rate. Now is that – you were saying that we didn’t have no actuaries, I tell you that never happened in Quinn time. VB: Okay, now you have made a big point about the unfairness on the part of Anglo Irish Bank in not allowing you to continue, your business plan involved no interest payments for eight years and further loans of approximately €670m. Now wouldn’t they have been irresponsible to have agreed to such a proposition for somebody who had acted as you had acted over the years. SQ: What I am saying to you is very simple I am saying that Matthew Elderfield was illegally putting an administrator into Quinn Direct. That’s what I am saying to you. SQ: You’re very conveniently forgetting part of it, and most of your colleagues in the media do the same thing. In 2007 and 2008, I could have no quibble, you were dead right, we were dead wrong. In 30th March 2010, there was next to €250m in there, the company was extremely profitable, the company was run extremely well. There was a new chairman on board, there were no breaches of regulation, Sean Quinn wasn’t on the board any more and the company was being run extremely well, and Matthew Elderfield, illegally in my view, put in an administrator. Probably the most profitable insurer on the island of Ireland. Now today, he seems to be taking a different attitude, if there’s financial institutions in play[? ], then what he will do is send someone in for three, six months to sort them out. Why did he not do that? What the above boils down to from the point of view of the €1.65bn upper limit of the Quinn Insurance bailout cost, that now confronts us, is the Sean Quinn accusation that it was – from his point of view – the illegally-appointed administrators who know nothing about the insurance business that have caused the losses. The 2009 accounts for Quinn Insurance which showed a €706m loss would seem to partially contradict what Sean Quinn is saying, but the jury is out on the losses that have been realised since the administrators took over. 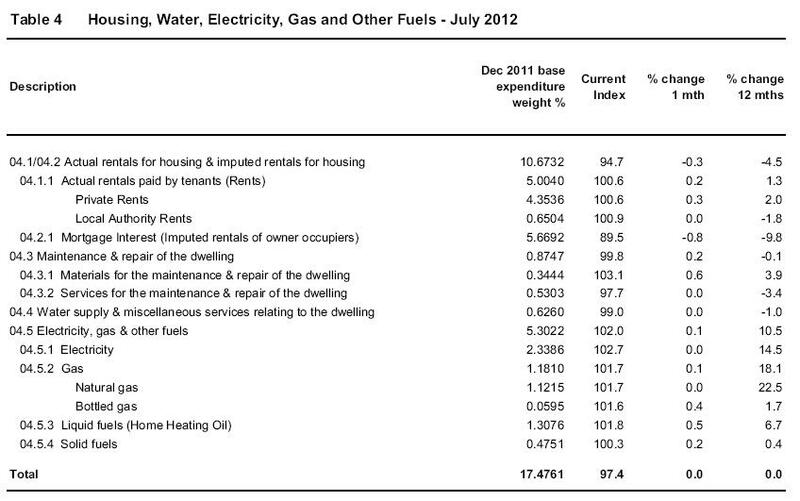 This morning, Ireland’s Central Statistics Office (CSO) has released its inflation figures for July 2012. The monthly headline Consumer Price Index (CPI) fell by 0.1% compared to June 2012, but is up 1.6% year-on-year (which continues a downward trend seen in recent months compared with the 2%+ that pertained in January 2011). Housing has stopped being the biggest driver of annual inflation, mostly because mortgage costs have been declining – by 9.8% in the past year, as ECB rate cuts and greater scrutiny of variable mortgage interest rates take effect. Just a few months ago, mortgage interest was rising by 20% per annum, and as mortgage interest costs account for nearly 6% of the basket which measures inflation, the impact on inflation was substantial. Energy costs in homes on the other hand, which account for 5% of the total basket examined by the CSO, have risen by 10.5% in the past 12 months, the same annual increase as pertained in March, April, May and June. Natural gas continues to rocket with prices up 22.5% annually. This should be a cause for concern. Elsewhere, private rents increased by 0.3% in July 2012 – the first monthly increase in four months – and over the past year, such rents are up by 2.0% according to the CSO – there is some small rounding in the figures above which show 2.2%. It seems that in our financial crisis, the big correction in rent took place in 2009 with a 19% maximum decline, compared to a decline of just 1.4% for all of 2010. 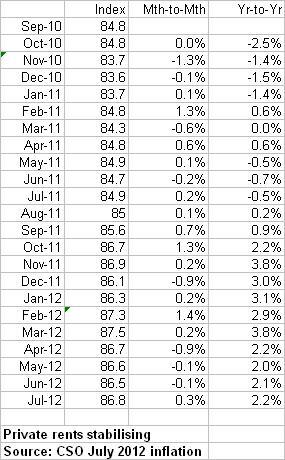 Since the start of 2011 there has been a 3.9% increase (mostly recorded in February and October 2011 and February 2012). At the start of January 2012, the Department of Social Protection reduced its rent assistance payments by up to 29% (an average of 13%) and the Department says that some 40% of the rented market in the State is affected by rent assistance payments, which at the end of 2011, was paid to 98,603 households. The Department’s 40% is derived from information provided to it by the Private Residential Tenancies Board, but the Department seems to have conceded recently that the figure may be lower in the order of 30%. The Department is projecting it will save €55m in 2012 from its €500m budget for rent assistance, the saving comprising €33m to changes to the minimum contribution and €22m in relation to the new maximum limits. The declines in April, May and June 2012, when three month notices given in January 2012 would have taken effect, might have been interpreted to herald the start of a trend, and the increase in July 2012 comes as a surprise.